This is the first one in bloom outdoors - although it is in a pot under the porch! Its gorgeous. Mine are only just poking through the earth. I think I need a porch Spritz. Looks like yours have just had enough protection to bring them on. Like Dawn mine are just showing a bit of leaf. Well - it's the same with most of mine, except the ones in the porch! It must be a couple of degrees warmer in there, even though it's open at the front. It is a gorgeous flower. Almost - I had to check her spelling. She's Kath'A'rine. That's the lady I had in a pot in the greenhouse. I shall plant the bulbs out soon. mine are only up by about 2" and wont open up for ages. thnaks for sharing yours spritz. Ooh I love this dark beauty Barbara! Hi Vicky - nice to have you back in the UK. That must have been a real pleasure. What a shame you didn't have your camera! I know we ment to take it but we had so many other things for the meeting to remember we forgot it!!! is it snowing with you spritz? Wow! that is a stunner, Spritz! Vicky - let's hope. No, our weather is damp but milder today. We actually hit 10 degrees (in the rain!) More rain forecast. The fields are like swamps. YUK! but yesterday it was ok but very very wet like you say everywhere but much warmer. plants like solidago come to mind... they are weedy and colonizers, very hardy and resist controls... some plantsmen finally decided to work on them and now they are in the catalogues... for years it was blamed for "hay fever" as it bloomed at the same time as the less visible ragweed...(the real culprit) and has been used for centuries as a dye producing plant. It is an organic source of many shades and tints of yellow and green depending on the mordant used. So perhaps we will find uses for some of those weeds? or perhaps we can accentuate their decorative properties? meanwhile... we slog it out with them! I have a large bed that has been colonized by solidago...I don't intend to get rid of it completely but find controlling it a bit of a challenge! I think that's true - but if you had some of the nasty little weeds that are not even ornamental, but can take over a bed, then you'd be pulling faces as you pulled them out, wouldn't you! Especially when they're laughing under a beautiful Salvia that looks dead. :-((( Boo hoo! any salvia I have planted in my garden never made the winter thro...of if it did the month of April took it out! I plant it as an annual. Sometimes, we just have to bite the bullet and admit defeat - I'm almost at that stage with Lavandula stoechas. I'm going to be pleased if they do make it, and shrug and replace them if they don't. 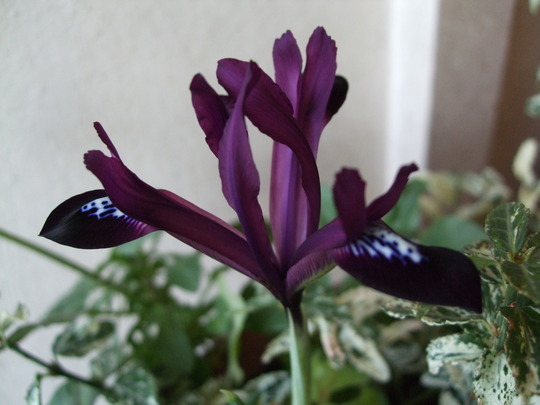 See who else is growing Iris reticulata 'Purple Gem'. See who else has plants in genus Iris.